Well, if you follow the mainstream school of wisdom, the answer to that question is simple: Outside factors, or "fundamentals," drive price trends in commodity markets. That can be a countless number of external factors related to the market itself, such as supply/demand data, weather patterns, political unrest in growing regions, other markets, and on. Now, for our take on the situation. According to our chief commodity analyst Jeffrey Kennedy, that same sugar "car" was about to make an abrupt U-turn -- U as in "UP." "I've noticed over the years that significant turning points tend to occur in years ending 0 and 5... as we move into 2015, I'm actually anticipating a significant low. I'm looking for prices to bottom this year. "I believe we're in the very late stages of the initial move down. Ideally, say as move into the fourth quarter of 2015, the [decline] will terminate ant that will give way to an advance where I expect sugar prices to actually double. "Once we do finish this move down, I will be looking for a sizable move, something that will easily push prices back up to 18, 20, even as high as 22." Sugar prices bottomed in late September, 2015, the "fourth quarter" time window that Jeffrey identified. When markets present Elliott wave counts as strong as the one that helped Jeffrey anticipate sugar's dramatic 2015-6 comeback -- it captures all of our analysts' attention. 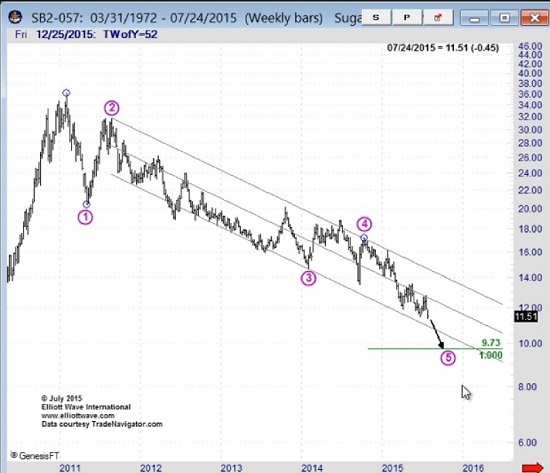 "As for other markets, if you have any experience in commodities, Sugar is a candidate for a [major move]." Get 32 pages of actionable trading lessons, hand selected by EWI's Chief Commodity Analyst Jeffrey Kennedy, designed to help you become a better trader. Absolutely free! Download your copy of Commodity Trader's Classroom now. This article was syndicated by Elliott Wave International and was originally published under the headline This Commodity Has Perked Up its Investors' Portfolios. EWI is the world's largest market forecasting firm. Its staff of full-time analysts led by Chartered Market Technician Robert Prechter provides 24-hour-a-day market analysis to institutional and private investors around the world.